UAE Prime Minister Sheikh Mohammed bin Rashid al-Maktoum said it is hoped that by 2050, 44% of the country's energy needs will be provided by renewables, with 38% from gas, 12% from cleaner fossil fuel and 6% from nuclear energy. 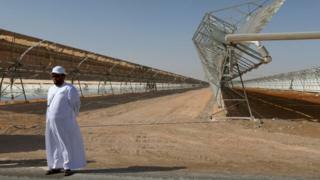 Can UAE ditch oil for renewable power? Writing on Twitter, he said: "The plan aims to increase usage efficiency by 40% and boost clean-energy contributions to 50%. "He who does not think of energy is not thinking about the future. The UAE government has made an achievement in drawing up a unified energy strategy for the country." Elsewhere, Morocco, Tunisia and Yemen pledged in November to use only renewable energy by 2050. Is Dubai’s construction boom sustainable? Video Energy summit: Can UAE ditch oil for renewable power?